What is another word for interpret? 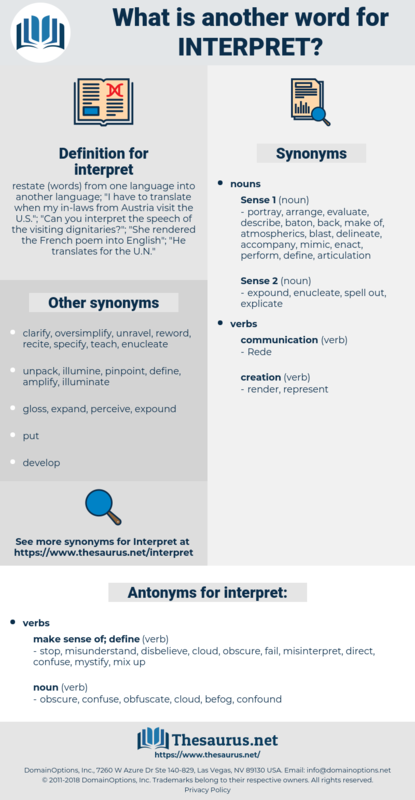 restate ( words) from one language into another language; " I have to translate when my in- laws from Austria visit the U. S."; " Can you interpret the speech of the visiting dignitaries? 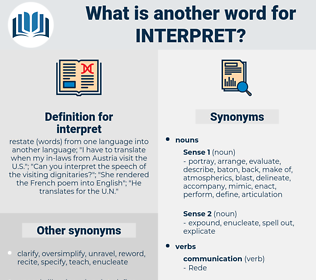 "; " She rendered the French poem into English"; " He translates for the U. N."
lay, perceive, comprehend, appreciate, elucidate, describe, determine, convey, clarify, assess. construe, explain, understand, decipher, interpretation, analyze, consider, perform. stop, misunderstand, disbelieve, cloud, obscure, fail, misinterpret, direct, confuse, mystify, mix up. He felt that he was the man the American people had chosen to interpret and express their opinion. I should interpret the picture as such, dear Mr. Ayling. re-explain, comment, misinterpret, moralize, commentate, reinterpret, gloss, annotate, moralise, deconstruct. stylise, profile, render, conventionalize, portray, show, mock up, animalize, carnalize, chart, model, picture, present, depict, map, capture, sensualize, silhouette, draw, graph, stylize, limn, paint, sing, animalise.